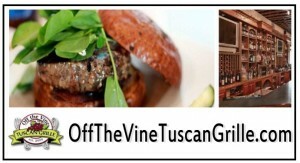 Off the Vine Tuscan Grille is a casual, family friendly, neighborhood restaurant serving both lunch and dinner. Our restaurant is warm and inviting, with friendly and professional service. Stop by to catch a game at our full bar or bring the family and enjoy a great meal. We hope to see you soon!